For over 40 years, librarian Cleo Watkins has tried every trick in the book to get delinquent patron Dixie Huddleston to return the most overdue volume in Catalpa Springs, Georgia. When Dixie says she’ll finally relinquish the book, Cleo is shocked. Superstitious Dixie says she’s seen the signs: she’s about to die and is setting her affairs in order. Cleo dismisses Dixie’s ominous omens…until she and her gentleman friend, Henry Lafayette, arrive at Dixie’s home to find her dead. Cleo suspects murder. The police agree but promptly list Cleo among the likely culprits. To clear her good name and deliver justice, Cleo uses her librarian skills to investigate, with Henry and her trusty bookmobile cat, Rhett Butler, at her side. Nora Page enjoys rainy weather, the perfect biscuit, and quiet evenings in with her husband and cat. You can often find her in the company of books. 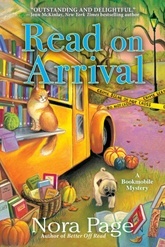 This is her second Bookmobile mystery.